Sigh...another day, another decision by Delta to drive their customers away. Unfortunately, Delta has decided to remove all of its Skymiles accounts from Award Wallet, a truly awesome site that automatically tracks your frequent flyer accounts (as well as their expiration dates). I wrote in this post that signing up for Award Wallet was one of the best ways for rookies to get into the travel and miles game. Delta, though, has decided that Award Wallet is holding too much member information and is "invading" Delta's site. I wholeheartedly disagree with this decision by Delta. 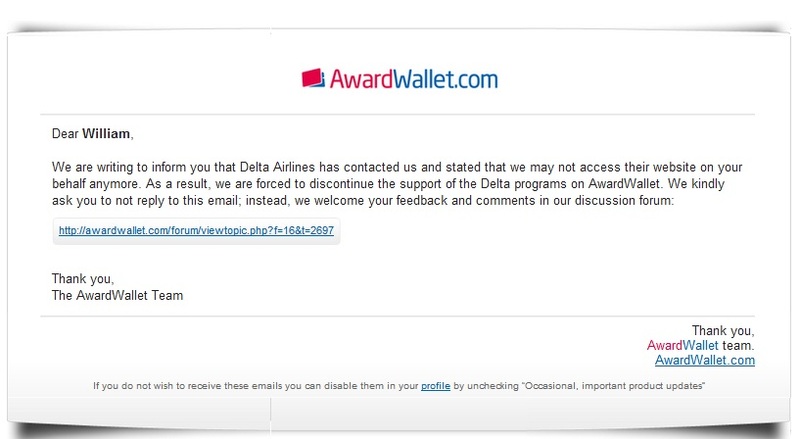 Even though Award Wallet tracks our frequent flyer balances daily, the ability to carefully monitor my accounts prevents the very fraud and potential for abuse that Delta claims Award Wallet perpetrates. With this change, I am less likely to check my Skymiles balance and less likely to visit Delta's own site. These are the unintended consequences of Delta's strong arm move! The real losers, though, are people who manage multiple Skymiles accounts. Families are now forced to check each individual account to make sure miles properly post rather than auto-updating using Award Wallet. 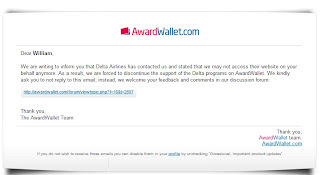 With Delta now joining American Airlines and Southwest in removing their data from Award Wallet, I become a less of a fan of Delta and less engaged in the Skymiles program. Hopefully Award Wallet can find a workaround for this problem or the two companies can come to an agreement on member data. For now though, Delta remains in the frequent flyer doghouse.